IDC Socket and Plugs offer board to cable connections. Featuring 0.100 in. contact centerline, SFH IDC Series Socket and SIP IDC Series DIP Plugs have current rating of 1 A/contact and are offered in 3/6 through 32/64 dual positions. Devices mass terminate single-layer, 0.050 in. 28 AWG flat ribbon cable in one step. Sockets are available with strain relief and polarizing keys to ensure proper mating alignment. Operating from -40 to +105Â°C, units feature dielectric voltage of 500 Vac and max contact resistance of 30 mW. Specifically designed to ensure durable board-to-cable interconnections in high-reliability, low-power applications, Sullins' IDC devices are well suited for a wide array of high-density, space-constrained consumer, commercial and industrial equipment. They are commonly employed in household appliances, HVAC equipment, gasoline pumps, and vending machines as well as in telecom and datacom applications. 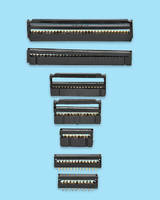 The IDC devices have a current rating of 1 A per contact, and are offered in 3/6 through 32/64 dual positions. Parts' materials are UL94V-0 rated, and are supplied with glass-filled polyester insulator material and phosphor bronze contacts. Additional specifications include a dielectric voltage of 500 VAC, and a maximum contact resistance of 30 milliohms. Offered with a broad choice of plating options, customers may choose from gold flash overall, gold flash on contact with 50 microinch nickel on termination, 15 microinch gold on contact with either gold flash or 50 microinch nickel on termination, or with 100 microinch overall matte tin. Operating temperature is -40 degrees C to +105 degrees C. Plugs are provided with straight or kinked solder tails to further support design flexibility. For additional information, contact techsupport@sullinscorp.com. While firm pricing is determined depending on customers' specification, typical prices for Sullins' IDC sockets range from $0.225 (3-position/6-pin) to $1.722 (32-position/64-pin) each in quantities of 1,000. In the same configuration and quantity, IDC plug prices range from $0.428 to $1.920 each. Delivery is 2 - 4 weeks. Samples are immediately available. Headquartered in San Marcos, CA, Sullins Connector Solutions, Inc. (www.sullinscorp.com) has been a world leader in the design, engineering, and manufacturing of high-quality edge cards and headers since 1971. The Company provides the industry's widest selection of UL/CUL approved edgecards, and additionally offers product development services together with engineering support. Sullins' edgecards, headers, bi-level and CompactPCI¤ connectors are widely specified for use in mission-critical applications by a broad spectrum of leading industrial, commercial, military and consumer products manufacturers. Sullins' connectors and interconnect systems are available through a global network of sales representatives and distributors.